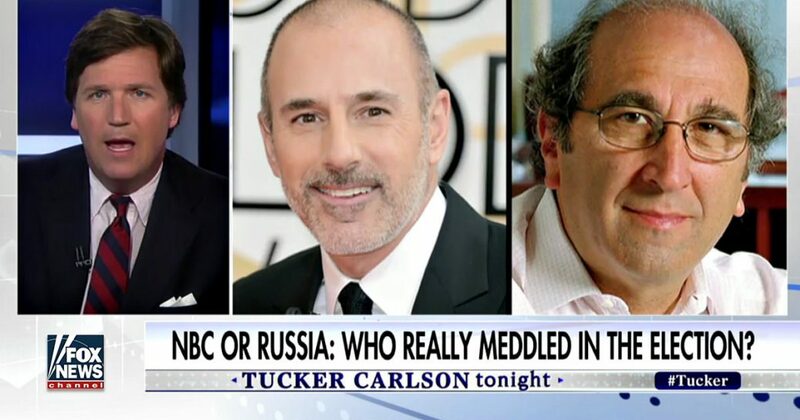 Fox News’ Tucker Carlson took NBC to task this week when he argued that it was NBC, NOT Russia that meddled the most in the 2016 presidential election. Carlson went on to prove, beyond a shadow of a doubt, that NBC had a bigger impact on the election than Russia did. voting machines or hacked any votes in November. There’s no evidence that the Russians collaborated with Donald Trump or his campaign to win the election. There is no evidence that Russian propaganda swung a single vote away from Hillary Clinton. There is in other words no reason to believe that Russia changed the course of American political history. There is merely innuendo and conspiracy mongering and connecting probably irrelevant dots. Lee Harvey Oswald spent time in Mexico City, okay, but what does that mean exactly? Nothing significant that we know of. Complaints from NBC about election meddling? Given that company’s conduct over the past six months that is a bit rich. Consider the infamous “Access Hollywood” tape. Now, if you are living in America last fall, you certainly remember it. The shocking and vulgar remarks. The immediate and disastrous effect that tape had on the candidate Trump’s poll numbers. It was a political bomb detonated in the final days of the most intense political race of our lifetimes. The fallout was so overwhelming that few paused to consider where that tape came from. So, let’s consider that now. That tape belonged to NBC, it was shot by NBC cameramen for an NBC show on NBC property. So, how did it wind up in the hands of “The Washington Post” which broke the story? How, in other words, did valuable intellectual property from one news organization end up benefitting a competitor. Intentionally. That is the short answer. According to sources at NBC, “The Access Hollywood” tape was leaked to “The Washington Post” with the full knowledge of NBC brass. That would include news edition head Andrew Lack. NBC’s motive? To derail the Trump campaign two days before a presidential debate. Now, keep in mind that the “Access Hollywood” tape had been sitting in an archive since it was shot 11 years before. NBC executives had known about its existence at least last summer — months before it aired. Concerned about being accused of partisanships and perhaps worried about California’s strict wiretapping law, which prohibits the recording of subjects without their knowledge, the network sat on it. But as November approached, the temptation to shut down the Trump campaign became too much. And so NBC rose to the defense of Hillary Clinton and leaked that tape. And then they lied about it. Now, if you’re a news organization and someone stole the story of the year out of your office, wouldn’t you want know how that happened? You’d think you would. And yet, as far as we can tell, NBC News has never conducted a meaningful internal investigation into how that tape wound up at “The Washington Post.” That’s because they already knew the identity of the leaker. It was them! Now, all of this is more or less common knowledge or at least commonly suspected in the tiny world of the TV news business. As we said Andrew Lack, [Chairman of NBC News and MSNBC] knew about it. So apparently did “Today” show anchor Matt Lauer. And yet until now, nobody bothered to tell the public. We are doing that now. By the way, we asked Lauer and Lack and the NBC PR Department for a response to all of this earlier today, they declined comment. Still the obvious question hangs in the air since we’ve been talking so much lately about election tampering and it’s this. What do you think played a bigger role in the 2016 race? The “Access Hollywood” tape or the Russian government? That’s an obvious one. Just because NBC’s effort failed and Donald Trump won anyway doesn’t mean it’s irrelevant. NBC News lied to the public to help destroy a politician they didn’t like. We know that. We know they wouldn’t do it again, do we? Do we know they’re not doing it now? Unfortunately we do not know that.